English courses with Twin: One of our English Teacher is Leaving: Goodbye Alex! One of our English Teacher is Leaving: Goodbye Alex! If our students love the English School in London and are satisfied with the English Courses they take there, it’s probably because English teachers make them love the language. As in any school, it’s important for students to have lively and enthusiastic teachers. At the English School in London, all the students know Alex and have a lot of things to say about him: he can explain very clearly, his lessons are really interesting, he is very funny… and so many other compliments. Unfortunately, Alex is leaving for Mexico where other exciting adventures are waiting for him. Everybody at the English School in London is sad about his departure, it was also a good opportunity to organise a farewell party for him. 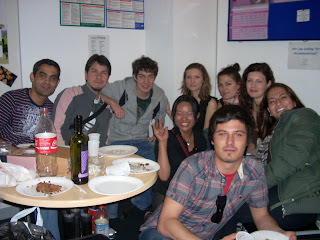 So, all students were invited to celebrate Alex’s latest days at our English School in London. Dania and her sister Dyana, two students write a very touching letter. I am writing to thank you very much for everything you gave us. It is very kind of you to teach us so well, and to take so much trouble over it. The way you teach us is truly inspiring. I hope that you are happy to go to Mexico and to have a good time there. But you must think about coming up to London. Do let us know if you would like to come and if you might be able to spend a few days with us in Twin. We would all love to see you.